The Starbucks Card offers you the convenience to treat yourself - or someone else - to your favorite things at Starbucks stores. It's the perfect gift for any occasion, and can be used at over 9,000 locations all over the US, Canada, UK, and Australia*. Starbucks, the Starbucks logo and the Starbucks Card design are either trademarks or registered trademarks of Starbucks U.S. Brands, LLC. 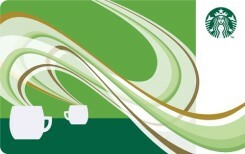 Starbucks is not a participating partner or sponsor in this offer. *In US only: Additionally, The value of this Gift Card can be loaded on to pre-existing Gift Cards.